Few cars have held as much prominence as the Subaru WRX did back in the 1990s. Tearing up roads and rally stages the world over with its turbocharged engine and all-wheel-drive traction, the WRX turned a humble family sedan into a cult icon that put the small Japanese manufacturer on the genuine performance car map. The Subaru WRX is now in its fourth generation, having launched locally in 1994. The WRX STI flagship followed in 1999, but the splendid looking car you see here is a 1999 Version V two-door GM8 Impreza WRX STI, one of only 399 to have arrived safely into Australia. Owned by long-time Subaru devotee Ben F, the 1270kg compact coupe was priced new at $60,000 and armed with a 2.0-litre turbocharged boxer engine producing 206kW and 353Nm. 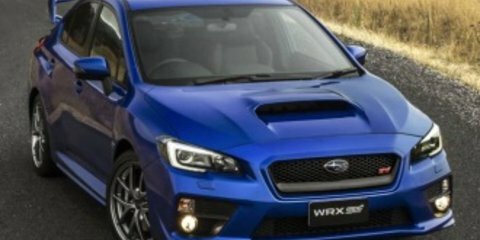 It has taken 15 years for Subaru to match the 0-100km/h time of 4.9 seconds claimed by the Version V two-door CG8 WRX, but it has in the new fourth-generation Subaru WRX STI. The new four-sedan stretches 25cm longer and 11cm wider than the ‘99 two-door, and is also 255kg heavier – the new car missing out on the old car’s standard aluminium bonnet and front guards. It therefore needs more power and torque to achieve the same performance, the new WRX STI being equipped with a larger 2.5-litre boxer engine developing 221kW and 407Nm. But the new STI costs just $49,990 and is equipped with the sort of technology and safety features its little blue ancestor wouldn’t have thought possible. Fifteen years past has seen the addition of safety technology such as: electronic stability control (ESC), electronic brakeforce distribution (EBD) and seven airbags; chassis technology such as active torque vectoring; and convenience equipment including a reversing camera, satellite navigation, a 4.3-inch LCD multifunction display screen, a 6.1-inch touchscreen and Bluetooth connectivity with audio streaming. Although Subaru exited the World Rally Championship (WRC) at the end of 2008 with three constructors’ and three drivers’ titles to its name, can the new car maintain the legacy? Unquestionably an impressive point-to-point road weapon, one of its greatest ever ancestors – next to the ultra rare 22B – is here to see just how it stacks up against its iconic gold-wheeled WR Blue history. A proper Subaru nut, Ben has owned eight Subarus over the last 14 years. “I started in a non-turbo 1996 Impreza, 2.0-litre four-wheel drive still, very, very gutless but a lot more grip than it had power, that’s for sure,” Ben says. “And then into a 1997 Impreza WRX, which was rally blue with gold wheels as well. “I think we talked before about the bonnet scoop, the colour, the big wing, the boxer note and the gold wheels. “It just does it for me I guess,” Ben says smiling. And it’s easy to see why when Ben obligingly trades seats to let us behind the wheel of the car he’s proudly owned for the last 12 years. Nestled nicely into the supportive bucket seat, two things immediately strike you driving the old STI: the view through the windscreen dominated by that bonnet scoop and the awesome boxer burble being emitted from the single cannon-style exhaust. Then you look in the rear view mirror and the rally car image is topped off to perfection with a rear wing standing 295mm tall above the boot lid. Far from feeling 15 years old, Ben’s (mildly tweaked) 1999 Subaru Impreza WRX STI remains a nimble and agile little thing that changes direction as willingly as the engine revs out to its 8200rpm limit. That’s an impressive 1500rpm higher than the new STI’s 6700rpm limit, the reasons for which Subaru Australia insists is factory knowledge only, and despite the older car’s EJ20 engine being a direct relative of the new STI’s EJ25 unit. From standard the ’99 STI’s EJ20 did, however, come with forged pistons, hollow stem inlet valves, sodium-filled exhaust valves and an 8:1 compression ratio. By comparison, the 2015 STI’s EJ25 (pictured below) runs an 8.2:1 compression ratio and features cast pistons and a nitride treated crankshaft. Turbocharger and intercooler sizes have also been increased since 1999, along with boost pressure. The new car’s IHI VF48 turbo has a maximum target boost pressure of around 17.4psi according to Subaru Australia, with the Version V STI’s VF28 in Australian delivered guise restricted to 15.7psi (though rumours of 17psi remain common even today). Regardless, the classic warbley boxer note of Ben’s ’99 STI is again present in the new STI, if a little muted. The clutch is springy but still provides plenty of feedback and the standard short-shift five-speed gearbox is impressively direct and notchy. The steering is very light off-centre, though still responsive to inputs, the system’s weighting loads up significantly once corner speeds and lock increase, becoming ever sweeter as you push and start to get the viscous coupled limited-slip centre differential working. Teamed with a viscous coupled limited-slip rear differential the ’99 Impreza WRX STI’s all-wheel-drive system splits drive evenly (50:50) between its front and rear axles. The new STI partners a helical type front diff and a Torsen type rear with a centre diff that can vary front to rear drive between 41:59 (no LSD operation) and 50:50 (full LSD operation) via a mechanical and/or electronically controlled electro-mechanical system. Our short blast from the past over, and its time for Ben to get his first taste of the new Subaru WRX STI. Stamped with a only, um, 19 ‘STI’ logos inside and out and with a wing that’s 20mm lower than the old car’s but higher than just about any other new production car, it’s hard to confuse the top-tier performance model with its standard 2.0-litre turbo-equipped WRX base car. “It seems the closest to a modern version of the ’99 I think,” says Ben walking slowly around the car. “It instantly looks more like an STI should. I think it’s probably the most aggressive looking out of all the new WRXs, going back to 2001. At the front, the older STI’s aggressive bonnet scoop and quad vents have made way for a tamer, smoother scoop that more closely resembles an open bonnet bulge. The original car’s STI-embossed fog light covers have been replaced with dual fog light/indicator units, though the black grille with central badge setup remains. The wing mirrors have moved from their previous position on the A-pillars to the doors and the number of exhaust pipes out back has quadrupled. Moments into his first steer and Ben is already enjoying much about the 2015 STI. “My first impression is that it’s just fast,” Ben says. “But stock for stock the new one seems to feel that way even more. Sitting even flatter on the road than his ’99 STI, Ben appreciates the new STI’s trademark boxer note and heavier but consistent steering and is envious of its standard centre differential controller and six-speed manual transmission. “I love this gearbox,” he says. But despite acknowledging that the new STI’s 2.5-litre engine is actually better than his car’s 2.0-litre unit when it comes to around town and point-to-point driving, Ben says he simply doesn’t like it as much. “I don’t like the way the 2.5-litre delivers the power,” Ben says. “I don’t think it’s Impreza-like or what I like an STI to be because it’s too linear. “But having said that, I don’t think the car’s worse for it. The car’s actually better for it, it’s just that I just like revving an engine all the way to 7000 or 8000rpm. It’s true, the new car may be more seamless in its power delivery but there’s no doubting it’s still plenty fast out of the blocks and has no problems hunting down corner after corner. Instantly feeling more refined in its execution of identical tasks compared with the ’99 two-door, the 2014 model makes driving hard a relatively comfortable affair with higher-speed bends easily dealt with. Somewhat surprisingly, though, the new STI can’t trump the old car’s claimed fuel consumption figure – 10.4L/100km versus 9.9L/100km respectively. Praising the new STI overall as a “solid package”, Ben feels there’s no real weak area. “Nothing sort of stands out as, ‘Oh they should really improve on that’,” says Ben. “But then when you look at any of its other competitors, it does sort of fall a bit short for the money. Having both driven old and new, its time to present Ben with the ultimate question: would he trade his 1999 two-door WRX STI for the new 2015 sedan? “Would I take the keys home to the new one over the ’99? No. If I could have both, absolutely. “I’d drive that thing [the new STI] around all day every day,” Ben says. “But compared to the ’99 STI, the new one is almost a cruisey, comfortable Liberty GT of old to me. “Then again, maybe it just comes down to the fact that I grew up with Colin McRae on my wall. Maybe that’s the difference driving one of these [the ‘99 two-door] and not a new STI. “It’s kind of like the new one ticks all the head boxes, where you’re like, ‘Yep, it makes sense, it’s easier to drive around, it’s probably faster point to point’… but it’s just not quite as exciting. So perhaps not quite as special as a ’99 two-door GC8 or the 22B, the 2015 Subaru WRX STI still has enough nous to evoke some of that classic rally heritage in even the most die-hard Subaru fan. Images by James Ward and David Zalstein.